Are you occupied by sending endless inquiries and comparing different quotes? How much time did you waste on these tedious work? Do you want an intelligent pricing tool to help you out? InstantQuote is your wise choice! You only need to input certain searching indexes, and then the real-time prices will show on your screen. You can subsribe the price monitoring and receive message notification when the price changes. The tool is simple to use and saves time. Do you want to have an assistant that can help you manage the latest quotations from different suppliers? With the help of InstantQuote, you can compare and manage multiple quotes from different suppliers at one place and get price comparison and analysis reports for different views. It makes your decision making easier. Are you upset about going through emails, searching WhatsApp records, but not finding a vendor's quotes? Now you can invite different suppliers to quote with the online consolidation function offered by InstantQuote. Multiple quotes from different suppliers will be automatically consolidated and present to you, Your suppliers could not acess to your inquiry history, therefore the quotes are secured and make sure that you get the best deals among various competitors. Your suppliers may in the mails, on the phones, in WhatsApp, or LinkedIn before, but now, you could have instant chat with all your existing and new suppliers through InstantQuote, all in one place. 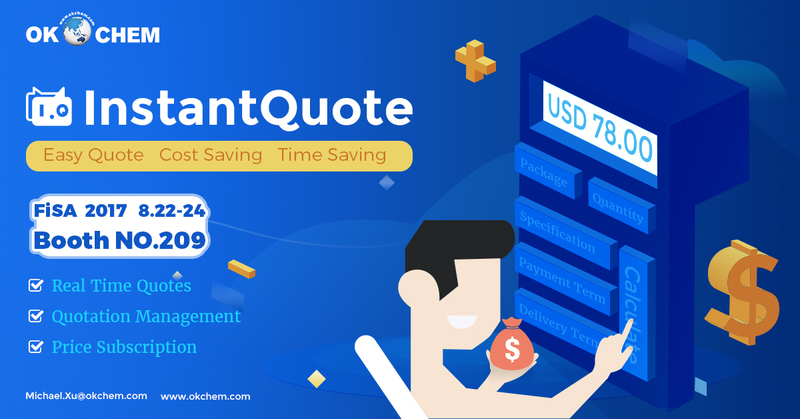 InstantQuote helps you inqure and manage quotes by a few clicks on your computers or mobile devices, anytime and anywhere. No more inquiry emails and phone calls, the quotation is now at your fingertips. Please follow OKCHEM.COM on Linkedin for more information!